Only the flame from a curious candle holder illuminated the murdered corpse of Karl Knock on a bitterly cold Massachusetts night twenty years in the past. When the efforts of local, state and federal investigators failed to cast more light on the crime than the little candle did, the case gathered dust, unsolved and forgotten. But when horror novelist Finn Ryan gets an invitation to dinner from a beautiful but eccentric and reclusive colleague, Tally Serzak, a web of danger sends its first, tentative filaments from that candlelit room. And nothing will ever be the same. Because Finn has secrets. So does Tally. And so does Newton, MA, Police Detective Warren Yost, who found Knock’s body on that cold morning so long ago. Now, on the eve of retirement, Yost decides to solve the old murder and go out with a last hurrah. As Finn’s involvement with the strange Tally reaches an intensity that has him running into walls, he begins to see similarities between himself and his own characters. He’s in a horror novel, except this one is real. There are no ghosts, no zombies or vampires. There is only Tally and an unfolding story Finn doesn’t want to see, but can’t ignore. As she knew he wouldn’t. Warren Yost sees the story as well, but can’t assemble its puzzle until Finn provides a last piece that will lead to a final, and deadly, resolution. 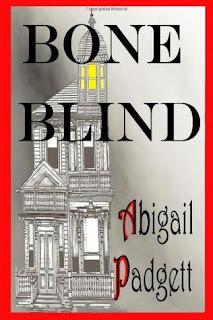 Abigail Padgett brings fear to the lives of horror writers in her novel, Bone Blind, by digging up an old murder case in which the killer was never caught. But Finn Ryan, one of the main characters, may know who the murderer is, though his desire to protect adds an air of complication to the investigation. Finn Ryan is a well known horror writer at work on his next book when author Tally Serzak crawls into his life. Finn is a guilt-ridden father whose only concern is to give his daughter everything she needs or wants. He creative, intuitive, gullible, and strange. But aren't horror writers supposed to walk on the weird side? Readers can connect with him on the level of caregiver/father. He's very loving, though if it only stems from guilt then that's not saying much. Padgett explores the guilt within in Ryan that started when his daughter, Katie, had an accident while he was supposed to be at home with her. Instead, he was having an affair. After multiple surgeries and physical therapy, Ryan is determined to give his daughter her every dream. I feel this tidbit of history will send readers away from Ryan, making it very difficult for them to form a strong connection. Yost is the second main character, a police officer who is about to retire and bask in the glory of his hard work. But he can't let go of the Knock case - it was his originally and he would love nothing more than to see it closed. As Yost picks up his investigation: retracing his steps, interviewing suspects, and piecing the story back together, readers will come to connect with him, but it won't be a strong connection. Though he's a respectable police officer, intelligent, and thorough, Yost also has affairs outside of his marriage and spends work hours slacking off. These two main characteristics work against Yost for readers. Especially after his wife is introduced, who Padgett writes as a sweet-hearted woman whose gotten a raw deal by marrying Yost. The story line was magnificent. The mystery surrounding the murder, complete with the smallest clues that can only be solved by looking at it literature-ly, created a shocking story line that will not be forgotten by readers. 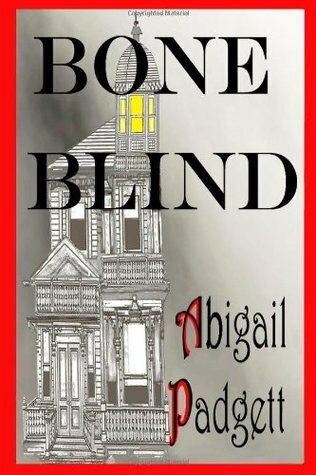 My favorite aspect of Bone Blind was the double story. Not only does Padgett write Finn Ryan's story, she also depicts the story that Finn's writing. The intriguing plot definitely makes up for the lack of character connection. Highly recommended for anyone who loves a good mystery/horror story!